It was an early start for a Friday and we had been out since dawn on a chilly morning. We were on the East Side of Abu Dhabi Island in an area of vegetation that in places betrayed its proximity to the Arabian Desert. We had photographed the odd starling, Isabelline Wheatear and Kestrel in poor light conditions. The tide was low and we crossed a dried out scrub area towards a narrow channel, just on the off chance that we might get better “shots”. Away to our right in a large windy inlet we could make out he faint silhouettes of about two hundred herons, about 90 percent of which were gray and white phase Reef Herons. Twenty Greater Flamingoes waited patiently for the incoming tide to bring in the small crustaceans, mollusks and algae on which they feed. Two thousand or so impatient cormorants (Socotra or Common?) had earlier flown off north towards the open sea. Suddenly we noticed four birds flying low, fast and straight towards us. At a distance they could have been cormorants, but even through the viewfinder a white leading edge on each wing and black wing tips. Geese, but what species? They whistled overhead at great speed and we knew our shots would be fuzzy. Imagine our delight when we saw them wheel in a tight arc and land in front of us about two hundred yards distant. Carefully we crept forward to some low saltbushes where we crouched, barely camouflaged, and in some doubt consulted our references. There was no doubt. All four birds were identical. The dark spot on a white breast, the faint collar, and the tinge of green on the primaries. 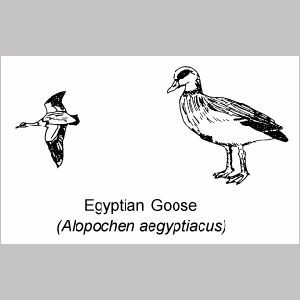 They were Egyptian Geese Alopochen aegyptiacus! As we clicked away, hardly daring to move, the birds walked slowly but fairly confidently to within a hundred feet of us, feeding on patches of bright green algae on a semi-exposed mud bank. Another clank of the mirror and they were suddenly up and off, a fierce clattering of wings as they made low and fast for denser coves. They remained in the vicinity during the morning, gradually moving back towards the airport. We have sufficient pictures to confirm our sighting and left them to continue feeding after their flight from-where? We have looked up as many records as we can find but there are none from the gulf area. 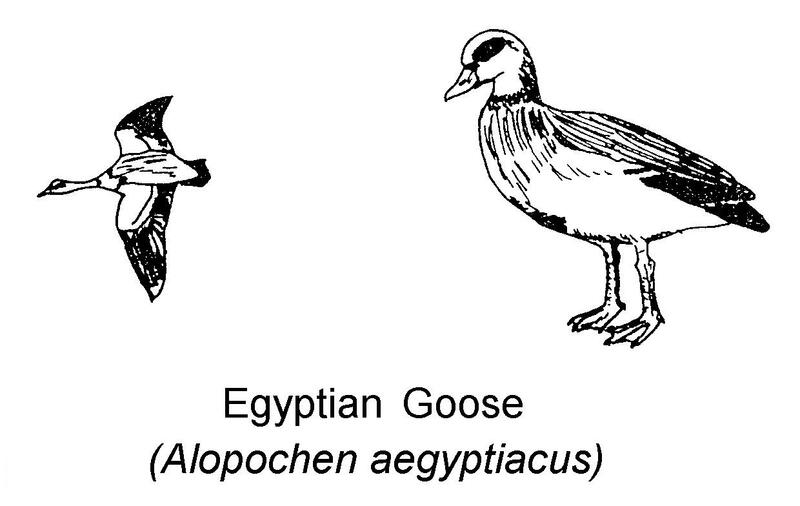 Meinerzhagen (1930) states that they are not recorded in Sinai or the Red Sea and they are not illustrated in The Birds of Iran. None of our four birds was ringed and we are fairly certain that they had not escaped from some local garden. Other birds Sighted on Abu Dhabi Island on February 16 1979.